The last component I added to my new bike were the handlebars, but one point I did not address yet was the width. I get asked on the “right” width from time to time, and as much as anybody just wants a simple answer, the problem with simple answers is that they are usually wrong. You may know the rule about handlebar width matching shoulder width. Sounds logical. Then you ask yourself: “Why would my handlebars have to be the same width as my shoulders? There’s quite a bit of arm in-between!” Personally I like narrow bars, they make me feel compact and fast. Wide bars make me feel like I’m riding a cruiser. Does bar width make a difference in my performance? Aerodynamically, the narrow bars probably are a bit better. Other than that I doubt it makes any difference. Some worry about the ability to breath, but with your arms free to take any position, I doubt that’s a real problem. It’s a little different with aerobars, where your elbows are locked in and hence if they are too narrow, it could affect the shape of your chest. But with dropbars that problem doesn’t exist. What’s your favorite bar width? Let me know in the comments section or call me out via twitter @gerardvroomen. My new bike – Less pain, less gain? I mentioned before that I am putting the Ergonova handlebars with anatomical grips on my new bike. This is actually the first time I spec one of my bikes with such a grip. I have always preferred the non-anatomical grips with the constant curve which, after extensive branding sessions,the industry has decided to call “round”. While the concept of only supporting your weight with the edges of your palms doesn’t sound comfortable, I actually like that feeling. This may be because I’ve always been told that’s what “the real pros” use and I am vulnerable to occasional bouts of cycle snobbism. In fact one pro (who shall remain anonymous) once pronounced a bike with an anatomical handlebar “unridable”, which I thought was pretty funny. Or it may just be that the the roundness on the other side (where your fingers are) gives you the sense of a better grip. Be that as it may, I’m going to ride these Ergonova anatomical bars for now. I’ve ridden them on demo bikes in the past, quite liked them, so it’s time for a longer test period. BTW, they differ from the 3T Ergosum anatomical bars in that while the grips are very similar in shape, the Ergonova has a broader, flattened top, which means that when riding on the tops your weight is distributed over a larger surface. Bigger surface, less pressure, more comfort, or so the laws of physics say. 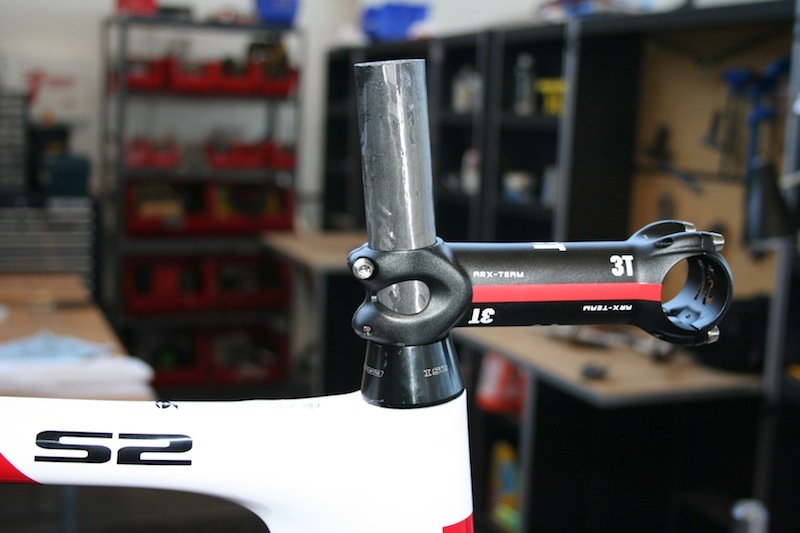 And if all else fails, I’ll go back to my trusted 3T Rotundo bars with “shallow round” shape (meaning round grips but not too deep, so the drop from tops to grips is manageable). Have you tried different handlebar shapes? Which do you prefer and why? Let me know in the comments section or contact me via twitter @gerardvroomen. Consumers often complain they can’t verify aero claims made by manufacturers. True, unless you have a windtunnel in your backyard. Bike manufacturers make claims on weight and on aerodynamics. The first you can verify, the second you can not. I would say they will AT BEST their aero claims will be as honest as their weight claims. Probably the aero claims will be even less honest. Makes sense, doesn’t it? If they lie 10% about a claim you can verify, do you really expect them to lie less about a claim you can’t check? So get out those scales and go weigh some aerodynamics! Do you like this idea? Then please Like this post or Tweet about it with the buttons below. Thanks! The handlebar I put on here is the 3T Ergonova. 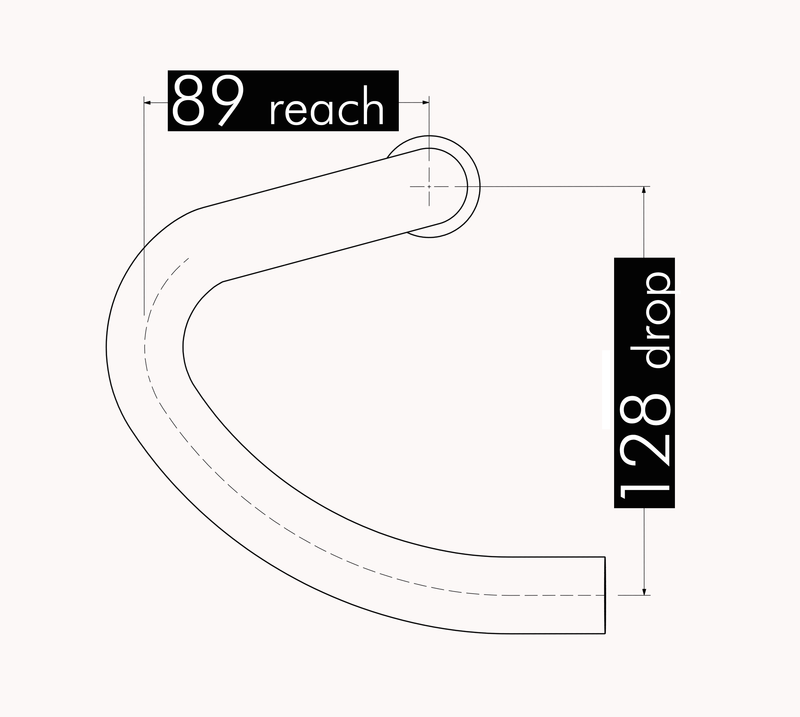 It has an anatomical drop, meaning that rather than a constant curve it has sections that are more or less straight at an angle about 45 degrees to the horizontal. This means that when your hands are in a natural position in the drops, they rest perfectly in that section and the entire hand is supported. If you have a constant curve (so the grip also curves inside your hand), the middle of the palm of your hand is not supported, only the edges are. 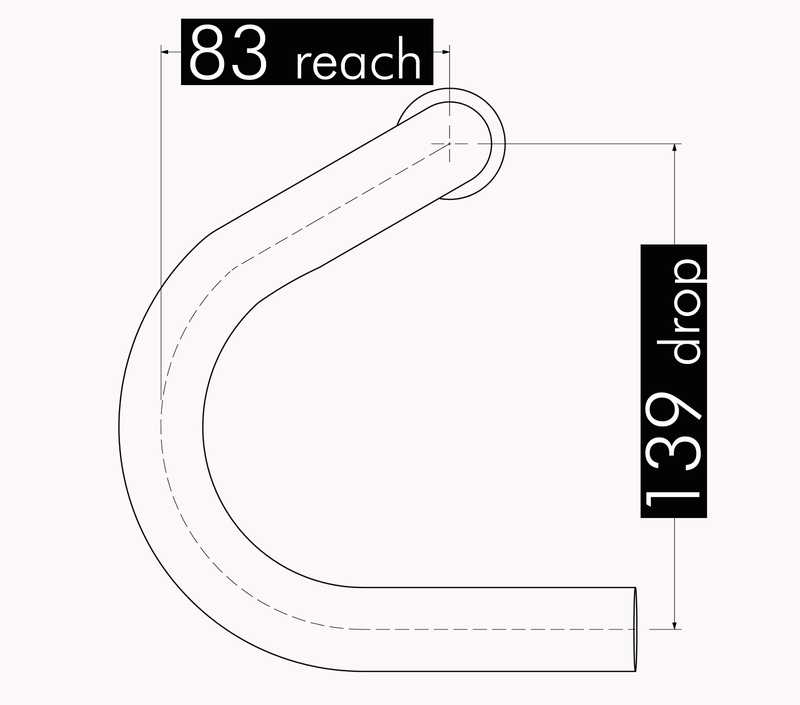 Virtually all handlebars on bikes sold to the public have this grip shape now. And if the suspense is killing you, does anybody recognize the shift-brake levers? To talk to me about that or anything else, just write something in the comments section or contact me via twitter @gerardvroomen. After my blog to eliminate team vehicles, I got some questions about how feasible this would be and whether it was fair that a simple mechanical could affect the outcome of the race. To start with the latter, it would be my view that any rule that applies equally to each rider is per definition fair. Of course such a rule increases the chance a one-time event changes the outcome of the whole race, but is that materially different from a crash in stage 1 that takes out one of the favorites? It really just extends the concept of what it takes to win. You already need mental, physical and equipment preparation today, we merely expand on the equipment preparation to increase the focus on durability and reliability. Plus, there will still be neutral support which could even include spare bikes. 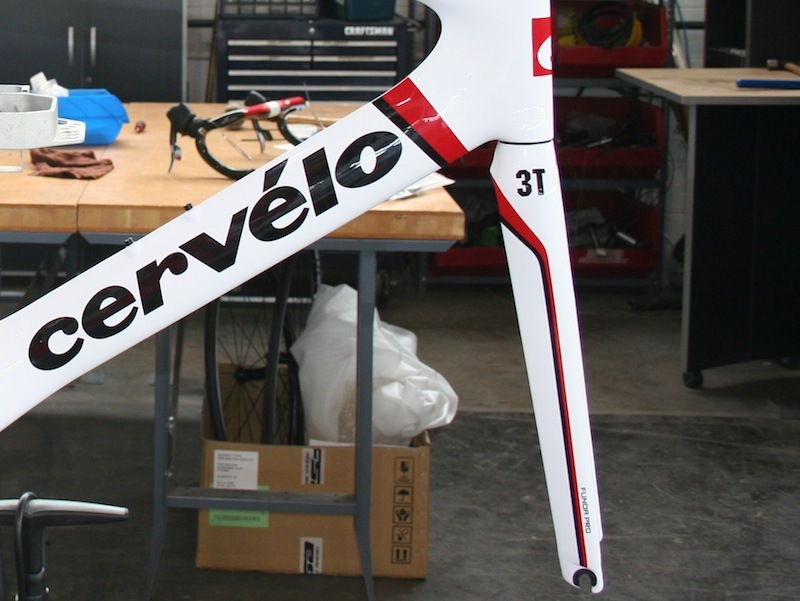 As to the feasibility from a product point of view, I can only speak from my past experience at Cervelo. Cervelo has participated in Paris-Roubaix nine times, and everybody knows it is the toughest race for the equipment. Yet we have never broken a frame, or any other part for that matter. So it is certainly possible to develop equipment that lasts. Maybe we are in a slightly unique situation because we always use the same frame for the pro team and the “regular” consumer, so durability is always a priority even if it’s not critical for the pros. This is less the case for manufacturers that make special frames for their sponsored teams, and unfortunately there are a lot of those. Obviously this practice would change, or at least the focus of the design of such bikes would change, which to me is another benefit of the proposal – the bike you see on TV would then actually be closer to the one you can buy in the store for all the brands. No more superlight frames in the races and as halo models while the actual frame in the store weighs a ton. The standard fork on the S2 is the Funda Pro, and it’s a fork I like. The shapes are aerodynamic, the ride quality is good. The Team version is obviously a bit lighter, but we only stock it in black. I have been known for weird fork colors in the past, such as a black R3sl with a Red Funda fork, which to this day I consider a beautiful combination. But this time I think the aesthetic really calls for the white fork, with the perfectly matching lines going on to the frame. Technically, the best feature of the Funda fork is the way the headset and stem are pre-loaded. Rather than the regular carbon steerer expanders that tend to loosen, the Funda has an alloy sleeve that you bond into the steerer. The sleeve strengthens the steerer in the most important spot – at the top bearing – and allows for a regular starnut to go inside said sleeve. Whatever you do, that’s not coming loose in my lifetime. It’s ironic that I write about the Volcano dustcap while sitting in a Rome hotel room, stranded on my way to Sicily because of an eruption of the Etna volcano (which I presume spews ash or shall we say; dust). To be honest, I don’t particularly like the look of the Volcano under the stem, but it creates a stiffer set-up than having a separate dustcap and spacers. And with my massive sprinting power, I need that 0.0003% extra stiffness (insert self-ridicule). So the Volcano puts the stem at the right height in one piece, making it elegant in an engineering sense if not in an aesthetic sense. Maybe I’m crazy, but I do actually think about these little things when spec’ing the bike, just because I can. That it won’t make a noticeable difference in the end doesn’t matter, that it is the “technically correct” solution does. This part was a pretty easy choice. 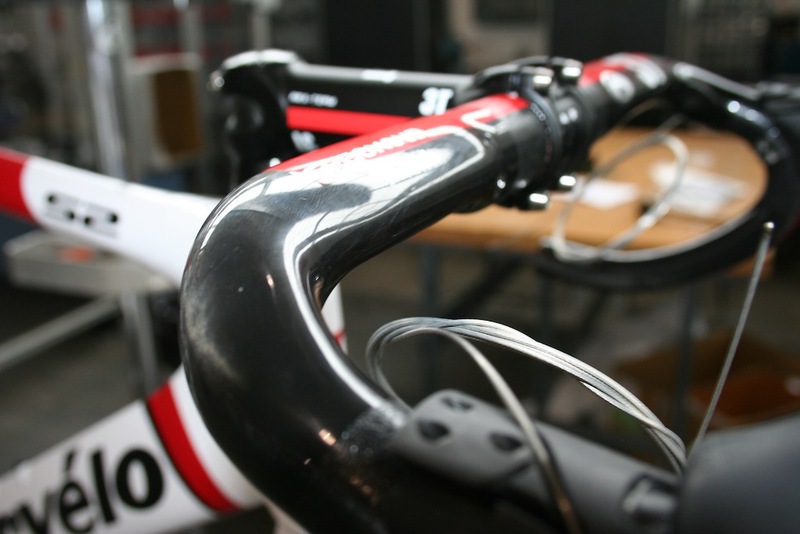 It’s the stem that we spec on most of our bikes because it is light, available in the right lengths and bombproof. No problem with tiny bolts that break or strip out, the only thing I really want from a stem it that it doesn’t cause me any problems and this one doesn’t. Especially when you travel a lot, it’s important that the bolts are 1) all the same size; and 2) able to tighten and loosen often. 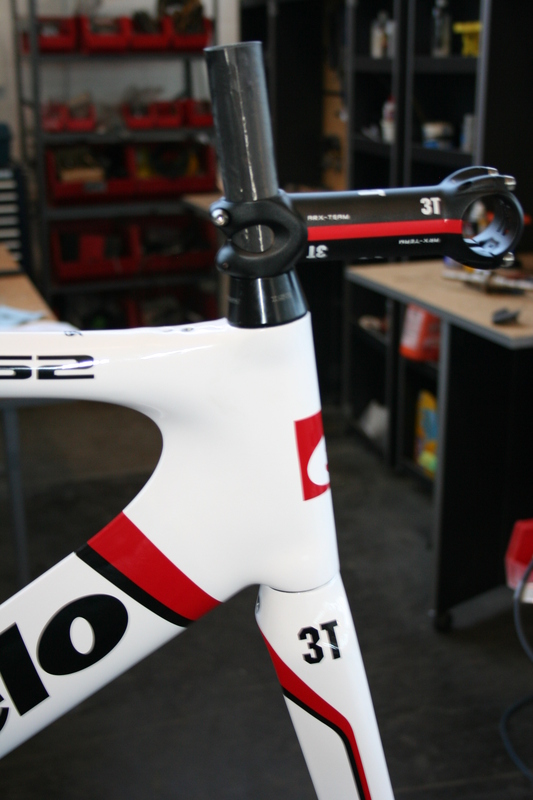 With the Ti bolts in the 3T Arx Team and the Alloy grade used in the stem body, that all works. Beyond that, it’s just a stem. Oh, and it has a red stripe, which is nice with the red stripe on the frame (the eye wants something too), although I think I would actually like a white stripe (from the Arx Pro) better. Maybe that’ll be a “vanity upgrade” later on. Although I ride many different bikes throughout the year, I don’t often get a new bike really for myself. My stable currently consists of a 2004 SuperProdigy and a 2009 S3. 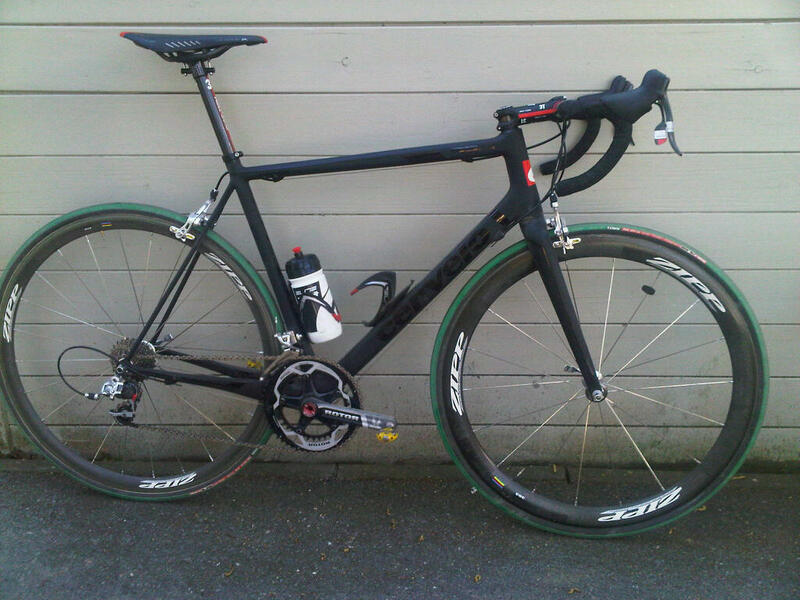 For my new bike, I had to stick with an aero frame (I’m so slow I can’t afford to lose any watts to drag). 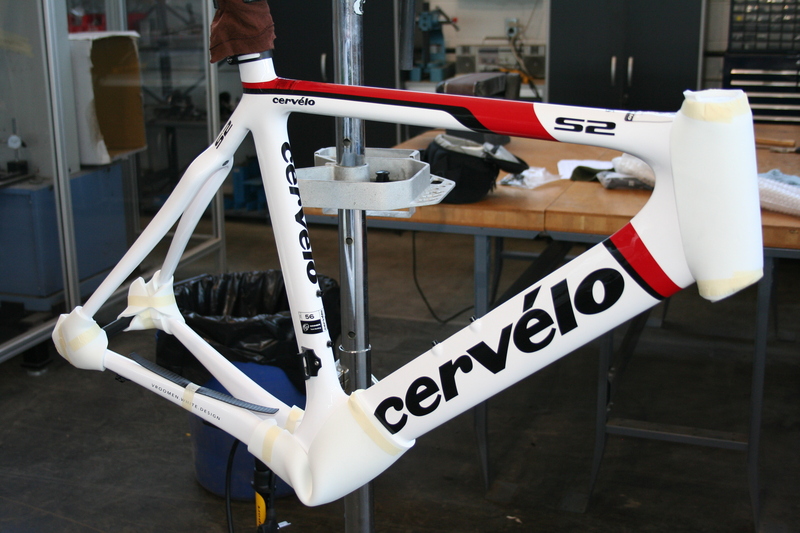 So I went with the most beautiful Cervelo frame of 2011, the WHITE S2. It sports what may be my favorite technical feature of all time, the ICS-3 system. Internal cables without the usual drawbacks of heavy internal housing, high friction or cumbersome routing. You just insert the cables at the top and they pop out at the bottom (for those who don’t have much luck doing this, make sure the frame is level, don’t hold it upside-down). Anyway, there is step 1, I’ll slowly build up my S2 on my blog this month. Tudicula means “small hammer”, it was the first word that popped up in Google when I was looking to distinguish my little Paris-Roubaix 2011 ride from Johan Vansummeren’s. We went with the office to Paris-Roubaix and rode the Arenberg forest and then to the finish on the Velodrome. 16 pavés, and I honestly think it may be a tougher test for the equipment than when the pros ride it, because at our slow speeds you really hit every bump instead of flying over half of them. So my logical choice was the R5ca. It just happened that there was a show model from Eurobike sitting in our office and I it was roughly my size, so why not put it to good use. This particular frame was a size 56, with the stock fork, 3T Team arbon seatpost, carbon handlebars and alloy stem, SRAM Red groupset, Rotor cranks and Zipp 202 wheels. Most of the group rode the 303, which was really designed with surviving Roubaix in mind (yet being very aero and light as well). But I was fairly sure the 202s would be OK as well as that’s what Thor rode in 2009. Tires were of course the 27mm Vittoria Pavés, which again got our group to the finish without any flats. The bike performed flawlessly, no problem whatsoever. I can’t say I was surprised as obviously I know all the test results of this frame, but still, to ride Roubaix on a sub-700g frame was neat. Next year maybe we get the team on them, this year that simply wasn’t possible given our limited production volume and long waiting list (luckily for me the show model I rode was one iteration removed from the final layup so not sellable).